เราเป็นผู้นำเข้าและตัวแทนจำหน่ายอย่างเป็นทางการในประเทศไทยของสินค้าหลาย แบรนด์ อาทิเช่น TANKO, TAEJIN, ROCKY,SAKAE, OSUNG MIDAS. We are an importer and distributor in Thailand of several brands such as TANKO, TAEJIN, ROCKY, SAKAE, OSUNG MIDAS. We are specialists in steel furniture. Industrial grade high-quality industrial and office. Founded in 1975, it has long-standing experience. The Research and Development Department constantly and designs to customers. In order to enhance the store. And to maximize meet the needs of customers. 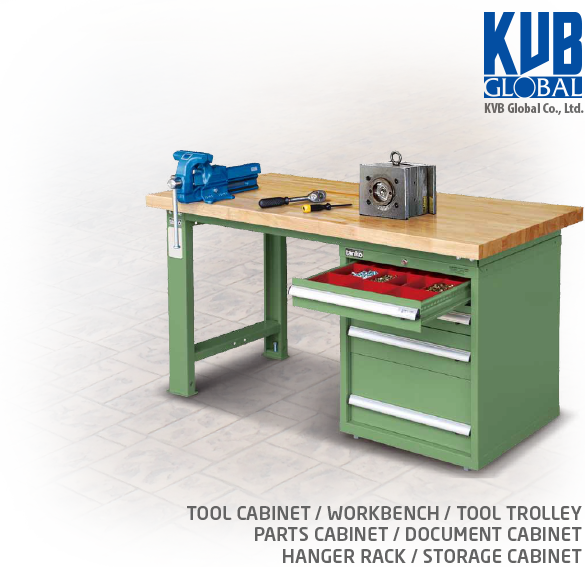 We are one of the leading steel furniture, steel cabinets, Benchwork Table, Document Cabinet, Parts Cabinet, Tool Cabinet, Hanger Rack, Mould Rack, CNC Storage Syatem. Quality and recognition from customers. The high quality steel furniture to maximize comfort in the workplace. And maximum safety. © 2015 KVB Global Co., Ltd. All Rights Reserved.